RNIB’s flagship publication, NB Online, is this year being recognised for reaching 100 years in circulation. Each month throughout the year, we look in the archives to find out what issues blind and partially sighted people have faced since the magazine started in 1917. 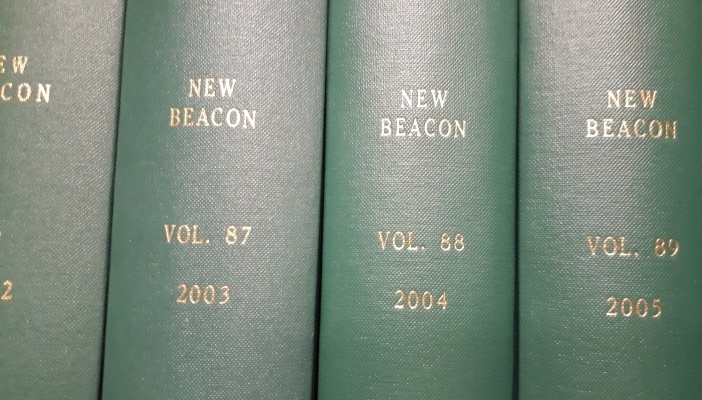 For the final time in this our special centenary year, we look back in the archives to December 2005 when New Beacon announced it would be discontinued. Fazilet Hadi, then the Group Head of Policy and Advocacy at RNIB, wrote that in its place, NB would be launching in January 2006. In January, not only will we be welcoming in the New Year, but also RNIB’s new magazine NB for all sight loss and eye health professionals, from ophthalmologists to rehabilitation officers to policy makers. This means that this issue of New Beacon is the last in its current form, and I’d like to thank all of New Beacon’s loyal readers and contributors who have added so much to the magazine over the years. In January we will be launching NB, the one magazine to keep you in touch with the latest developments in sight loss and eye health. We’ve recently carried out research with a wide group of professionals, exploring what they want to read and gaining expert advice on hot topics for 2006. We added this insider information to the very useful feedback New Beacon readers have given us in questionnaires over the summer and have used it to develop NB. In January, we will have stimulating comment and analysis on the Government’s proposals for integrating health and social care. Throughout the year we’ll be talking to the experts and outlining what new eye care pilots across England, Scotland and Wales will mean to people with sight problems. Real-life solutions will be at the heart of a series of articles on care, rehabilitation and leisure, starting with improving communication and emotional support through the use of aids and equipment. Our Letters column is sure to be thought-provoking and controversial. We’ll also be discussing jobs and income and just why so few people with sight problems are in employment. Last, but not least, NB’s new career focus will get to grips with issues such as status and qualifications for rehabilitation officers, provide fascinating glimpses into other people’s working lives, as well as pages of job opportunities in every issue! Your subscription to New Beacon will automatically be transferred to NB. The cover price remains the same at £2.40 per issue for UK readers and £3.40 for overseas subscribers. In 2006 we will be publishing NB every month, including August, and so the annual subscription has risen accordingly. Vision, Insight and RNIB’s new free product and publication guide. NB isn’t the only change for RNIB magazines. Vision, the magazine for members of RNIB, is increasing in frequency to bi-monthly this December to ensure information is up to date and gives more opportunities for member interaction and dialogue. The magazine will also include more about new and recommended products, access to benefits and social care, the latest technology, Government initiatives, and services from RNIB and other organisations. January also sees the launch of Insight magazine, which will be essential reading for parents and teachers of children with sight problems, including children with complex needs. The very best of Curriculum Close-up, Eye Contact and Visability, which are due to close at the end of the year, will be included in the new Insight magazine. We will also be replacing Welcome to a World of in January with a free bi-monthly guide to new and recommended products and publications. Current readers of Welcome to a world of will be automatically transferred to the new product and publication guide. Thanks again for your support and all the best for the festive period. I’m really looking forward to enjoying NB with you in the New Year.